This is a summary of the topics and notes that I found interesting from watching the Advanced Swift WWDC session 404 by John McCall and Dave Abrahams. I highly recommend you watch the session. It also has some commentary from me which you may or may not agree with. Please feel free to join the conversation. You can find Part 1 here. I have also attached a swift playground file with the sample code for part 2. Let's look at a simple example of implementing the Printable protocol that allows you to provide a custom description that will be used by println. Unfortunately when using the playground, the Printable protocol isn't used. I assume this will be fixed at some point. 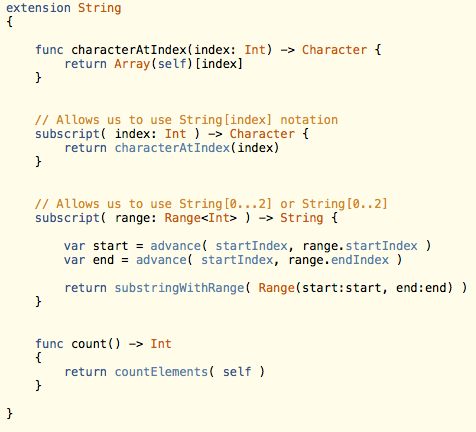 You can use Swift's subscript declarations to add subscripts and even support for subscript ranges. Here is a useful example adapted from a Stack Overflow post that extends the String class to add subscript access to Strings. var string = "abcdef" var firstChar = string var subString = string[0...2] // subString equals "abc" var subString2 = string[2..4] // subString2 equals "cd"
While you can have your subscript code perform arbitrary work, care should be used to make them behave in a way that is consistent with what people would expect subscripts to do. Swift also supports operating overloading. I'm not a fan of operating overloading as I think it creates maintainability issues. I would advice to use operating overloading very cautiously. We also added a new method to our Thing class which is nameWithArticle so it can provide a basic implementation of using "a" vs "an". The next feature is one that I was hoping Apple was going to bring to Objective-C and that is Generics. Generics is a powerful concept that allows you to reuse code while preserving and leveraging strong typing. In fact, we have already used generics (see the Range parameter under Subscript Declarations). No more using an id, NSObject, or in Swift the Any type unless you need something to be truly typeless such as a collection that can hold multiple types or for dynamic polymorphism. Here is a simple example that shows a generic function that just prints the given value to the console and then returns that value back out. Most compilers treat generics as templates and generate additional code for each type instance of the generic. However, Swift doesn't to do this. It only has one instance of the code for its generics. In addition, the Swift compiler generates more efficient code when it can make optimizations based on the type. The above example uses the Equatable protocol to let the compiler know it can perform the "==" operator. There is a lot more on equatable and generics in the session, and I encourage you to watch it. There is some very cool stuff that Swift can do with its generic system. There is a mind blowing example of a generic "memorize" function that is worth studying.